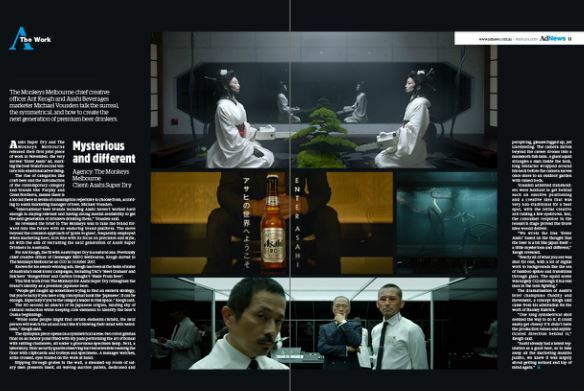 The Monkeys Melbourne chief creative officer Ant Keogh and Asahi Beverages marketer Michael Vousden talk the surreal, the symmetrical, and how to create the next generation of premium beer drinkers. Asahi Super Dry and The Monkeys Melbourne released their first joint piece of work late last year, the very surreal ‘Enter Asahi’ ad, marking the beer brand’s second venture into emotional advertising. The rise of categories like craft beer and the introduction of the contemporary category and brands like Furphy and Great Northern, means there is a lot out there in terms of consumption repertoire to choose from, according to Asahi marketing manager of beer, Michael Vousden. “International beer brands including Asahi haven’t worked hard enough in staying relevant and having strong mental availability to get the next generation of drinkers drinking them,” Vousden said. He revealed the brief to The Monkeys was to take the brand forward into the future with an enduring brand platform. The move beyond the common approach of ‘grain to glass’, frequently employed when marketing beer, is in line with its focus on precision and style, all with the aim of recruiting the next generation of Asahi Super Drinkers in Australia. For Ant Keogh, the fit with Asahi Super Dry is a natural one. Previously chief creative officer of Clemenger BBDO Melbourne, Keogh moved to The Monkeys Melbourne as CCO in October 2017. Known for his award–winning ads, Keogh has been at the helm of some of Australia’s most iconic campaigns, including TAC’s ‘Meet Graham’ and Snickers’ ‘Hungerithm’ and Carlton Draught’s ‘Made From Beer’. This first work from The Monkeys for Asahi Super Dry reimagines the brand’s identity as a premium Japanese beer. “People get caught up sometimes trying to find an esoteric strategy, but you’re lucky if you have a big conceptual hook like ‘Japanese’. It can be enough. Especially if you’re the category leader in that space,” Keogh said. The 60–second ad smacks of its Japanese origins, landing shy of cultural reduction while keeping core elements to identify the beer’s Osaka beginnings. “While some people might find certain elements clichéd, the next person will watch the ad and react like it’s blowing their mind with weirdness,” Keogh said. The dystopian piece opens on a symmetrical scene: two robot geishas float on an indoor pond filled with lily pads performing the art of bonsai with rattling chainsaws, all under a ginormous specimen lamp. Next, a laboratory. Stoic security guards observing harried scientists roaming the floor with clipboards and trolleys and specimens. A manager watches, arms crossed, eyes fixated on the work at hand. Slipping through grates in the wall, a steamed–up room of salary men presents itself, all waving auction pallets, dedicated and perspiring, glasses fogged up, yet unrelenting. The camera moves beyond the career drones into a mammoth fish tank. A giant squid strangles a man inside the tank, long tentacles wrapped around his neck before the camera moves once more to an outdoor garden with raised beds. Vousden admitted stakeholders were hesitant to get behind such an emotive positioning and a creative idea that was very non–traditional for a beer spot, with the initial creative sell raising a few eyebrows. But, the consumer response in the research stage proved the brave idea would deliver. “We wrote the line ‘Enter Asahi’ based on the thought that the beer is a bit like Japan itself — a little mysterious and different,” Keogh revealed. The dramatisation of Asahi’s brief champions fluidity and movement, a concept Keogh said came from his admiration for the work of Stanley Kubrick. “One long symmetrical shot seemed the way to do it. It could easily get cheesy if it didn’t have the production values and sophisticated direction behind it,” Keogh said. This first appeared in AdNews in print as part of The Work feature. The Work: How naughty or nice was Myer's bauble?